Wall Arch Before Collapse | Arches | Oh, Ranger! Wall Arch, located along the popular Devils Garden Trail at Arches National Park collapsed sometime during the night of August 4, 2008. Rock has continued to fall from the arms of the remaining portion of the arch necessitating the closure of the Devils Garden Trail just beyond Landscape Arch. First reported and named by Lewis T. McKinney in 1948, Wall Arch was a free standing arch in the Slickrock member of the Entrada sandstone. The opening beneath the span was 71-feet wide and 33-1/2 feet high. 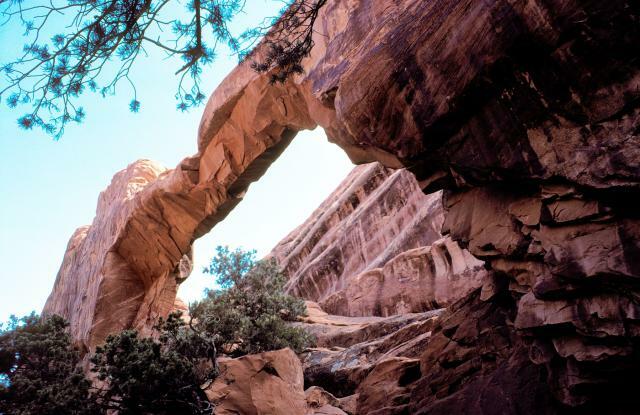 It ranked 12th in size among the over 2,000 known arches in the park. All arches are but temporary features and all will eventually succumb to the forces of gravity and erosion. While the geologic forces that created the arches are still very much underway, in human terms it’s rare to observe such dramatic changes. No one has reported observing the arch collapse and there were no visitor injuries.